Internet Security: Ensure your security with Le VPN’s VPN service. John McAfee’s Twitter Account Hacked? Your IT infrastructure calls for enhanced security, privacy, and customization. In the recent days, we have come across news where hackers install malware that logs your keystrokes. As a result, they easily hack your personal details- including banking and credit card details. That’s not it. You may also fall prey to cyber criminals who virtually kidnap your data, and seek a ransom from you. Hence, internet security or online security is many popular terms today. It is important that when you access the internet, you have a clear knowledge about how to stay safe. If you do not take enough care about your internet security, you risk your vital data. The internet-security pioneer, John McAfee recently said that someone hacked his Twitter account. The hacker was using his social media account to promote the lesser known crypto-currencies. Currently, John McAfee is also a cryptocurrency enthusiast. And he was issuing daily updates about the best cryptocurrency. However, some days ago, he stopped writing on a daily basis, and rather switched his “coin of the day” post with “coin of the week.” According to McAfee, his account was hacked through his mobile phone. You need to take your internet security seriously, as the cyber security giant is also not so safe. Opting for a Virtual Private Network, or a VPN, is a smart choice. A VPN encrypts your data and offers great security for it. Therefore, one cannot easily infiltrate your system. One must not fall prey to free VPN service providers as you will only end up in a mess. It is very much vital that you choose the service provider wisely. Le VPN is among the most reliable VPN service providers in the market today. A large section of people today relies on Le VPN to remain safe from hackers and online eavesdroppers. When you pick Le VPN, all your system and data is hidden behind its highly secure servers. Le VPN uses the most advanced AES-256 algorithm. As a result, it becomes next to impossible for anyone to even know your online activities. This helps in keeping all the data completely secure. There is no question of any hacker intercepting the data. With Le VPN, you can even protect your connection to hotels, public Wi-Fi hotspots, airport lounges, etc. 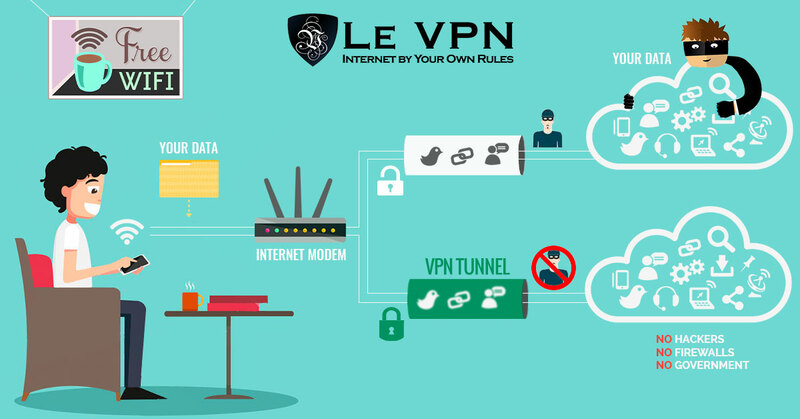 No unauthorized access to your data and systems can happen when you use Le VPN’s VPN service. Hackers often target online shoppers. Especially, when they use a Wifi connection, they can be prone to the threat of online thefts. Le VPN can significantly reduce this risk. Open Wifi sources often attract these shoppers, and they end up losing their privacy. With Le VPN, you can get full security against these threats, and that too without compromising with the internet speed. You can use VPN for Android phone and stay safe on the go. You can also benefit from Le VPN’s great discounts. Get 2-years of Le VPN service at only $69.60 and ensure your internet security.